Yep, Jordan Ellenberg sure is keen about his chosen field of study. The imagery described above, guaranteed to make any nerd tremble at the knees, is a perfect precis of his current release, How Not To Be Wrong: The Power Of Mathematical Thinking. The objective of the book is twofold. Firstly he’s addressing the age-worn question, posed in best whiny-student voice, “But what will I ever use algebra for after school?” Secondly it’s asking us to change our outsider view of mathematics, to see it not as a field entirely concerned with black and white, truth and falsity but as one which specialises in probabilities, the grey areas between right and wrong where politicians fear to tread. 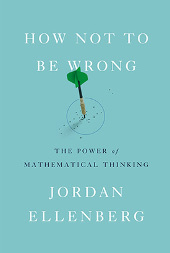 How Not To Be Wrong takes a fairly comprehensive journey through modern maths, organised as a series of stops in fairly wide-ranging sub-fields which, despite our protestations to the contrary, impact our daily lives in ways we rarely imagine. For example, the topic which opens the book is a mixture of probability and expectation. Ellenberg piques our interest with a real-life puzzle posed to a team of boffins during WW2. Aircraft returning from missions were examined on landing and the bullet-holes in various parts of their bodies logged. The top brass were anxious to lose as few planes as possible and this meant providing armour but heavy metal plating on a lightweight aircraft means a trade-off in terms of speed and maneuverability. So, where to put the armour for maximum effect? This is the key to How Not To Be Wrong’s success as a layman’s guide to what seems to be becoming an increasingly murky and ill-understood world. Ellenberg is simply one of the most gifted writers I’ve encountered when it comes to taking an easily-comprehended real world problem or situation and slowly peeling away the layers until we come to the revelatory maths underneath. Think Freakonomics but with fewer shoddy inferences and a lot more hard thinking behind the scenes, the kind of book that lets you coast by on a superficial read but will increase its rewards exponentially with every extra ounce of effort you impart. That said, it’s not all rosy. I was jolted out of my mathematical revery once or twice by utterly inexplicable and entirely unnecessary attacks on atheism, characterising atheism’s recent rise in popularity as ‘two billion billion fighty books on the topic of “you should totally be a cool atheist like me”’, as if completely blind to the fact that pro-religious books in any store outnumber the freethinking ones by a factor of ten easily. Not to mention the proliferation of churches, temples, etc around the world, the lack on non-religious leaders, the fact that atheists are labeled as terrorists or even threatened with death sentences in some countries. Better stick to maths Mr Ellenberg, methinks you’re ill-prepared for other arenas as your unashamed admiration of Pascal’s Wager betrays. However such minor blemishes certainly won’t affect the experience for the majority of readers. They’ll delight in attacks on our legal systems (‘The purpose of a court is not truth, but justice.’), sly asides on late-night pot sessions and the conspiracy theories they engender (‘It’s a very interesting mental state to be in. But it’s not conducive to making good inferences.’) and examinations of the truly insane status of wealth in our modern world (‘if you’re down a million bucks, it’s your problem; but if you’re down five billion bucks it’s the government’s problem’). How Not To Be Wrong is a true eye-opener of a book, one with a very real power to help you view the world from a different perspective. From the lofty peaks of mathematical awareness, and with a little practice and discipline on your part, you may well find your day-to-day errors in judgement, expectation and calculation diminishing noticeably if not entirely. And even if not you’ll certainly be hugely entertained along the way by a mostly amenable and charming host. That’s got to be worth a few hours of your reading time.